i’ve switched from caldavsync to davdroid - and everything works (contacts, tasks) but the main calendar. i’ve deleted all reoccurring events - but still it doens’t sync fully. i can’t see any entries from the server, but local entries get synced sometimes. how do i generate logs for further investigation? “Read error: Connection timed out” means that there was a timeout when reading from the server. Maybe your server responds too slow? Can you check the server logs to see how long the requests take? I’ll try to get these numbers BUT the reason will be the huge number of entires (therefore i killed the reoccuring events). These other apps probably use PROPFIND instead of REPORT to query the server. 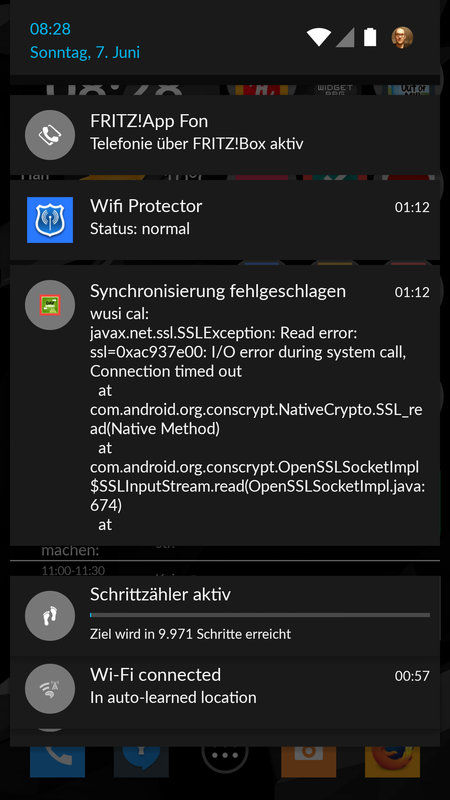 DAVdroid uses REPORT since v0.8 because it’s required for different operations and doesn’t transfer unnecessary data. I suggest to ask in an OwnCloud forum what might take that long (after verifying that it’s really a timeout on the server; just have a look at top and the server logs). Please follow up in #539 and https://github.com/owncloud/core/issues/16786.